The Volkswagen Scirocco is undoubtedly one of those models that American customers would love to have come to the U.S. Judging by how much frustration we’ve seen and heard from some of our readers, there’s a decent chance that their opinions reflect that of a majority of VW fans. But the Scirocco still doesn’t have a timetable to make its US debut, and it probably won’t have one until the big bosses in Germany say so. For now, all we can do is sit back and enjoy (from afar) what the 2014 Volkswagen Scirocco has to offer. It’s still one of the better-looking models in VW’s lineup, that much we can tell you. Even then, the updated styling on the front and rear sections definitely did their jobs in giving the Scirocco a more distinctive look. Combine that with new exterior lighting and some new retro touches to the interior, like the auxiliary instruments and you have the makings of a car that will once again leave a lot of U.S. customers pining for the day Volkswagen brings the Scirocco across the pond. Maybe it’s going to be sooner than we think, or maybe it won’t happen at all, but we all can still hope, right? 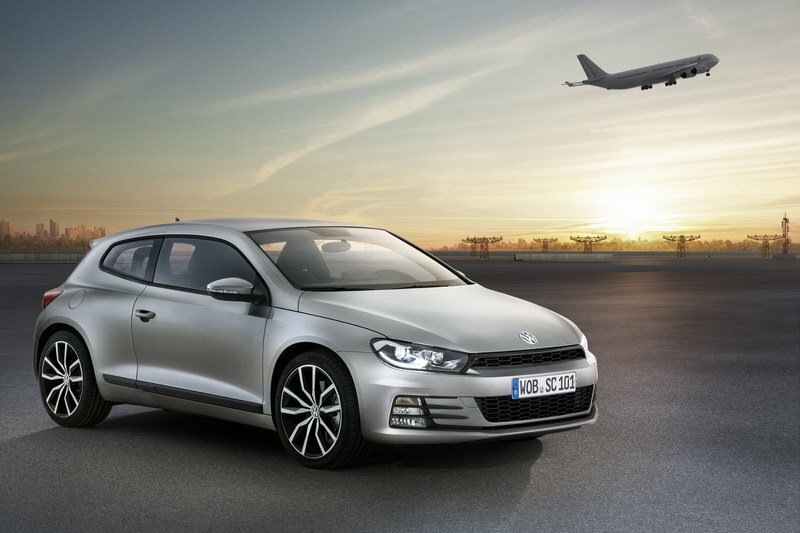 Click past the jump to read more about the 2014 Volkswagen Scirocco. The front section looks pretty much the same, but look closer and you'll see a new light signature on the headlights and new aerodynamic blades just to the side of the bumper. Now in the middle of its third design incarnation, the spiffy Scirocco soldiers on with a dynamic design that clearly has a lot of American customers scratching their heads on why the Scirocco hasn’t made its way in the U.S. The noticeable changes to the 2014 model will probably lead to more of that, now that the Scirocco has been refreshed with a cadre of new features. The front section looks pretty much the same, but look closer and you’ll see a new light signature on the headlights and new aerodynamic blades just to the side of the bumper. Together, these two new details create a more pronounced appearance, wider and more contoured than last year’s model. Going back to those headlights, a closer look shows narrow, convex LED contour underneath the xenon module, functioning as daytime running lights and creating a sense of class and refined function. 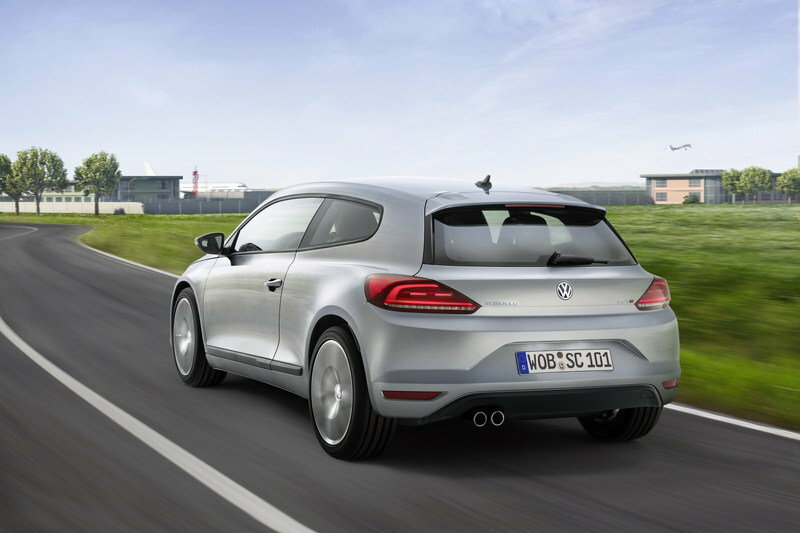 Newly designed LED rear lights and a new hatch design are the most pronounced changes on the rear of the 2014 Scirocco. The former now looks a little bigger, extending further into the hatch, where it meets with a horizontal light-refracting edge just below the window. Finally, a plethora of new wheels are set to become available for the Scirocco, including the standard 17-inch "Long Beach" alloy wheels. Likewise, the air nozzle panels and the central panel have been flush-mounted in the instrument panel with a new aluminum look, creating a more luxurious vibe to the cabin. The 2014 Scirocco doesn’t veer too much away from its standard design and the same can be said for the interior. That being said, you can still find a bevy of upgrades to make the cabin look fresher and more neatly arranged. One of the first that you might notice is the instrument panel trim on the passenger side, which now looks cleaner to the eye, thanks to its more streamlined appearance. Likewise, the air nozzle panels and the central panel have been flush-mounted in the instrument panel with a new aluminum look, creating a more luxurious vibe to the cabin. Look just above the center console and you’ll see three auxiliary instruments that are now standard, each providing information on the car’s boost pressure, chronometer and engine oil temperature. This new design is particularly noticeable because of how it has modern functionality, while also paying homage to the first Scirocco, which also had these auxiliary instruments inside its cabin. Another pair of new interior features for the 2014 Scirocco are the storage compartment close to the handbrake lever and the redesigned seats that are made from new materials. The "Matthew" material (a tartan design with titanium black seat surfaces) really caught my eye for the way it blends the colors nicely. There’s also a new "Greg" Alcantara material that is available in "Ceramique", "Deep Mocca" and "Titanium Black" finishes. The 2014 Volkswagen Scirocco comes with a wide range of options, beginning with the small 1.4 TSI that produces 122 PS, all while returning an impressive 42 mpg. From there, the rest of the Scirocco’s engine lineup features a 2.0-liter TSI that develops 210 PS. Diesel options are also available in the form of two 2.0 TDI engines that develop 140 PS (BlueMotion engine) horsepower and 177 PS. 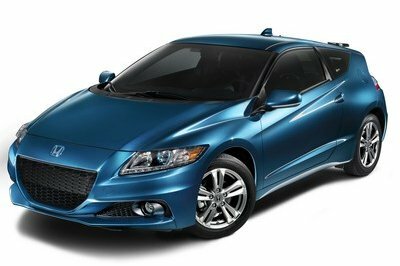 Both diesel engines also offer healthy fuel returns, ranging from 54 to 57 mpg. Performance numbers aren’t out yet, but we expect the most powerful iteration to hit 60 mph in a little over seven seconds to go with a top speed of close to 140 mph. There are about a zillion trims and engines to choose from in the Scirocco lineup, and the on-the-road price ranged from £20,530 for the base model with a 1.4-liter TSI engine to £30,240 for the top-of-the-line GTS model with the 2.0-liter TDI engine and the six-speed DSG transmission. The BMW 1 Series 3-Door looks pretty pedestrian compared to our expectations from BMW, which, in our eye, already puts it behind the eight ball against the Scirocco. But the 1er still has some interesting details about it, a nod to the continued ingenuity of BMW. The 1 Series three-door is being offered with a big choice of gas and diesel engines featuring BMW TwinPower Turbo technology. The base version is the 114i powered by a four-cylinder engine with 102 horsepower, while the other extreme will take you to the 125i with 218 horsepower. BMW also added a 170-horsepower 118i engine and a 184-horsepower 120d engine into the mix. All engine variants come with optimized six-speed manual transmissions as standard, while an eight-speed automatic transmission or eight-speed automatic sports transmission will be offered as options. 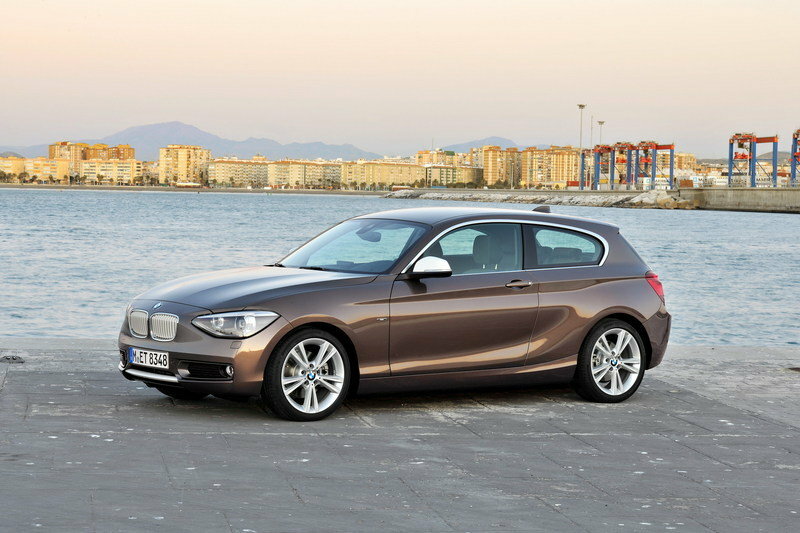 UK pricing for the BMW 1 Series Three door begins at £17,775.00. Volkswagen has done a great job with the Volkswagen Scirocco, so much so that it’s hard to pick now between the Scirocco and the Audi A3. The A3 used to be head and shoulders above the rest in terms of its design, but the Scirocco is making it earn its money now. 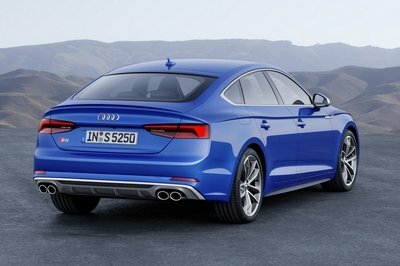 The current A3 is also being offered with a variety of engines, including the 1.2 TFSI with 105 PS, 1.4 TFSI with 122 PS to 140 PS, the 1.8 TFSI with 180 PS, the 1.6 TDI with 105 PS, and the 2.0 TDI with 150 or 184 PS. 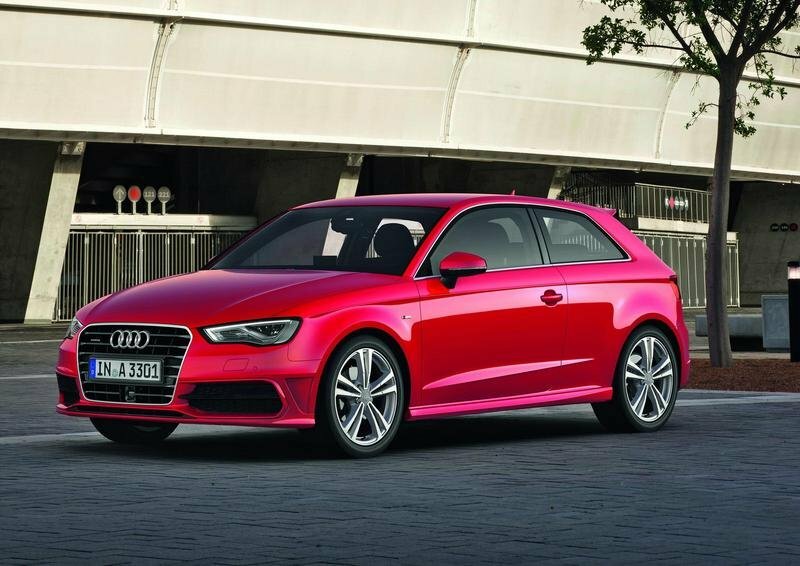 Price for the Audi A3 begins at £18,280 for the 1.2 TFSI and go all the way up to £29,435 for the 2.0 TDI quattro. It’s hard not to get too excited about the Volkswagen Scirocco. That is until you realize how hard it’s going to be to get a hold of one. Our friends from the other side of the Atlantic have had nothing but good things to say about Volkswagen’s powerful sports hatch, and while it’s difficult to corroborate those sentiments, we’ll still take their word for it. Combining a sporty and aggressive look with a variety of drivetrain setups, the Scirocco is one Volkswagen model that we’re still waiting for. We don’t even mind if its late to the party, just that it comes here eventually. In 1974, precisely 40 years ago, the first generation Scirocco made its debut at the Geneva International Motor Show. The coupé has since enriched the lives of all those motorists who love dynamic performance in an agile, confidently stylish and affordable sports car. Volkswagen now presents for the first time – once more in Geneva – the latest generation of the icon which has sold more than one million units. It has been developed further technically and visually. For example, the engines: the six turbo direct injection engines belong to the latest generation of Volkswagen’s four-cylinder engine family and consistently fulfil the EU 6 emissions standard; moreover they are up to 19 per cent more economical. 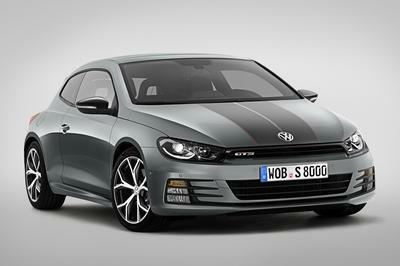 Also as standard, all Scirocco with up to 162 kW / 220 PS have a Stop/Start system as well as a battery regeneration mode. The performance of the four TSIs (petrol engines) and two TDIs (diesel engines) ranges from 92 kW / 125 PS to 206 kW / 280 PS in Europe. Despite the reduced fuel consumption, all the engines demonstrate improved power. The largest leap is taken by the new Scirocco 2.0 TSI with 132 kW / 180 PS (previously 1.4 TSI with 118 kW / 160 PS) and the 280 PS Scirocco R (previously 195 kW / 265 PS). Exterior sharper, interior loaded. The external characteristics of the Scirocco "2014" include its newly designed front and rear sections with redesigned H7 or bi-xenon headlights and LED rear lights. The rear and now swivelling VW logo was designed as a handle for opening the boot lid. The interior is equipped with sport seats and a leather sport steering wheel as standard, while the sports car also features new materials and colours. New technical features include the Dynaudio Excite sound system developed specifically for the Scirocco and the park steering assistant (ParkAssist). Also new on board as standard are auxiliary instruments (charge pressure, chronometer, engine oil temperature) which pay tribute to the original Scirocco. 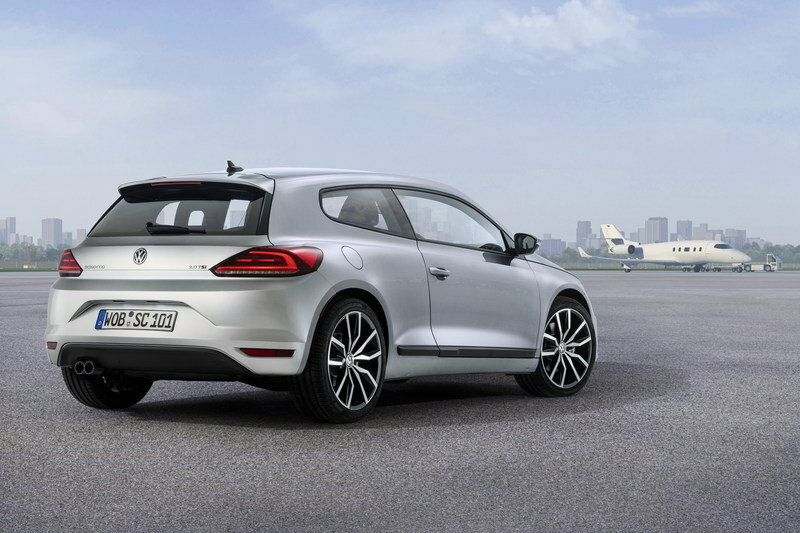 Scirocco to be launched on the market in summer. Volkswagen produces the latest Scirocco at its Portuguese works close to Lisbon. 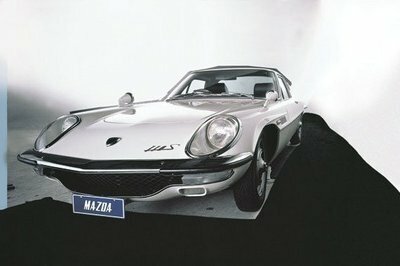 The sports car will be launched initially in Europe from the middle of August. Shortly afterwards, the other high-volume markets such as China, Argentina, Turkey, Australia, Russia and South Korea will follow. Design dynamics. The design forms the visual basis for the overall sporty package of the Scirocco: with its unmistakable silhouette, the characteristic rear, the impressive front end and its appealing proportions the coupé also demonstrates visually that this car offers a high degree of agility and therefore provides driving fun. Like the first generation Scirocco, the third series of the sports car is also viewed as a stylistic icon. Reason enough to sharpen the design of the Scirocco carefully – although it can be recognised as "new" at an initial glance – in order to develop its character further. New front section. Precisely drawn lines, a fully new light signature by the headlights as well as aerodynamic "blades" (narrow aerodynamic elements in the style of the Golf GTI) in the side of the bumper join together to form a new front section look. The new Scirocco also appears to be more clearly contoured and wider, due to the bumper surfaces painted in body colour as opposed to being kept black. The narrow "blades" and a black, open-topped frame in the bumper form a striking contrast for light paint. The large cooling air inlet in the lower area of the front section and the upper air inlet are kept black. Together with the XL1 and the Beetle, the Scirocco is also the only Volkswagen where the VW logo is on the bonnet. In order to protect the front section better against damages when parking, the ParkPilot is now also provided for the front bumper. New headlights. Striking light design is typical for all Volkswagen models. This illuminated fingerprint is particularly interesting for the new Scirocco when the new bi-xenon headlights are fitted: the engineers and designers have integrated a narrow, convex LED contour underneath the xenon module which looks like an eyelid and functions as daytime running lights. The indicators are placed separately in the outer regions of the bumper, with fog lights as well as the daytime running lights in the standard version. They are visually separated by the "blades". Together with the body-coloured trim for the lower cooling air inlet, the result accentuates the width of the car. The new design also makes the Scirocco appear to sit even lower on the road. New rear section. The brand’s design DNA defines that the width of the vehicle in the front and rear areas is accentuated by using horizontal design features. The new Scirocco further reinforces this effect using completely newly designed LED rear lights and also a new boot lid. The trapezoidal contoured rear lights towards the centre of the vehicle with their C-shaped light contour now extend further into the boot lid which, in turn, is equipped with a horizontal light-refracting edge underneath the window. A new black diffuser matches this powerful and precise design, making the bumper appear to sit lower and the car as a whole flatter in its proportions. Practical: as stated above, the VW badge swings upwards when pressure is placed on the central axis in order to thus serve as a handle for opening the boot lid (which is protected against dirt). The number plate lighting also uses LED technology as standard. New wheels and colours The newly designed 17-inch ("Shanghai") and 18-inch ("Lisbon" and "Salvador") alloy wheels attract attention. As standard, the Scirocco is equipped with 17-inch "Long Beach" alloy wheel rims and 205mm tyres (from 110 kW 225mm tyres). 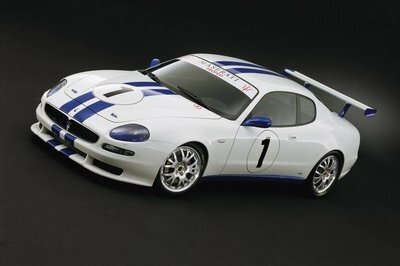 Optionally the coupé – and this is new too – can also be ordered with the legendary "Talladega" design 18 or 19 inch alloy wheel which was previously reserved for the Scirocco R. Moreover, five of the 13 available colours are new to the line-up: these are the three standard paints "Pure White", "Flash Red" and "Urano Grey" as well as the metallic colours "Ultra Violet" and "Pyramid Gold". The exterior of the Scirocco R. Traditionally independent design and upholstery elements characterise the top model in the series: the Scirocco R. This is equally true for the design of the front and rear aprons in motor sport look and for the wheels. In particular the three large, glossy black air inlets, the standard bi-xenon headlights, the LED daytime running lights and the LED indicators attract attention at the front. At the side, this includes the door mirror housings in "matt chrome", the side sill extensions with "R" styling and the brake callipers painted black with "R" logo. At the rear, the chrome tailpipes (respectively on the left and right) and the larger roof edge spoiler still belong to the insignia of the "R"; whereas the large air outlets in the bumper must be mentioned as new in the rear section. The standard 18-inch wheel trim for the Scirocco R was also redesigned. It is named "Cadiz"; optionally this alloy wheel can also be ordered as a 19-inch version. Auxiliary instruments pay tribute to the original Scirocco. The new Scirocco has also been developed further in several areas inside. Thus, the optimised instrument panel trim on the passenger side which visually streamlines the dashboard with a striking horizontal edge is eye-catching. The air nozzle panels and the central panel around the navigation system with an aluminium-look are now flush-mounted in the instrument panel and thus accentuate the high-end quality of the interior. Like models such as the Golf GTI, the Scirocco is now also equipped with a new tubular-look instrument cluster; the instruments features new graphics and are smartly framed with an aluminium-look. The steering wheel design was also derived from the Golf GTI. Additionally, the three auxiliary instruments integrated above the centre console are included as a standard: charge pressure, chronometer and engine oil temperature. They serve as a tribute to the first Scirocco in which, dependent on the equipment version, two auxiliary instruments were installed lower down in the centre console. It goes without saying that the new Scirocco is also still equipped with standard features such as air conditioning, Hill Hold, electric windows and sport seats. Sporty decor, materials and colours. There is now a storage compartment close to the handbrake lever which can be closed using a "sliding blind". It is no coincidence that the new decor - "checkered black" - in the central panel forms an optical bridge to the world of the Golf GTI. Last but not least, the seats have been redesigned with new materials. New are "Matthew" (a tartan design with titanium black seat surfaces), as well as "Greg" Alcantara which is available in the hues "Ceramique", "Deep Mocca" and "Titanium Black"; as well as "Vienna" leather in the colour variants "Ceramique", "Sioux" and "black in carbon style". Also new: the light upholstery trim "Ceramique" for the lower section of the dashboard, door trim panels and the centre console which is offered in addition to "black". The interior of the Scirocco R. Similar to the exterior, the interior of the Scirocco R is marked by the hand of Volkswagen R GmbH. The individualised features include the "Race" seat covers with the "R" logo and decorative stitching in crystal grey, the black roofliner, decorative "Carbon Race" inlays, applications in glossy "Piano Black" (radio faceplate, multifunction leather sport steering wheel and door handles) and stainless steel pedals. The specific "R" instrument needles are traditionally blue and the aluminium door sill plates are complemented by an "R" logo. Up to 19 per cent more fuel efficient. 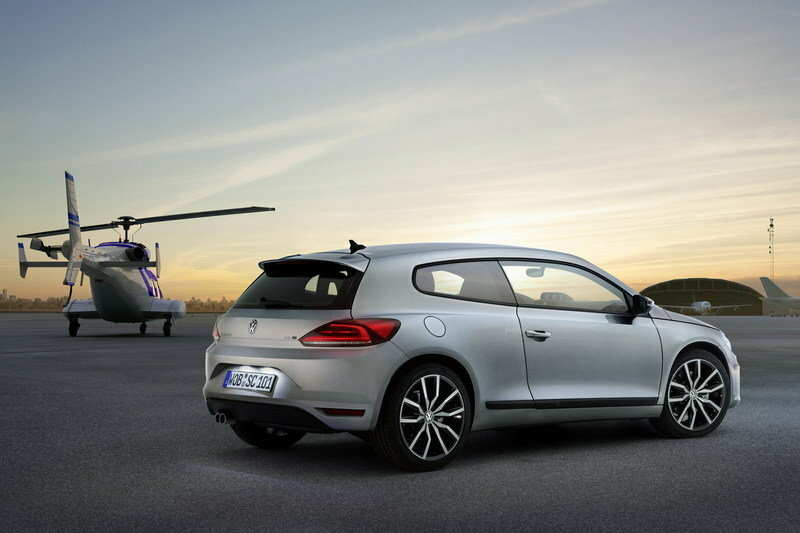 The 2014 Scirocco will be supplied with state-of-the-art technology for Volkswagen’s four-cylinder engines. The perfected or new turbocharged direct injection engines all fulfil the stringent EU6 emissions standard; moreover they have been made up to 19 per cent more economical. Despite the reduced fuel consumption, all the engines demonstrate improved power. As standard, all new Scirocco up to a performance level of 162 kW / 220 PS also have a Stop/Start system as well as a battery regeneration mode. 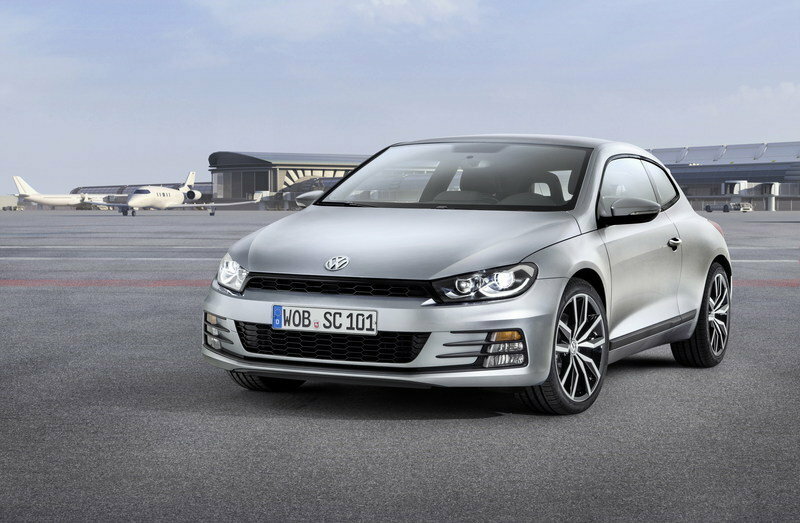 Except for the base engine (1.4 TSI, all Scirocco models can be combined with an optional dual-clutch gearbox (DSG). Petrol engines have power outputs of between 125 PS and 280 PS. The performance range of the four TSI (turbo direct fuel injection engines) extends from 92 kW / 125 PS via 132 kW / 180 PS and 162 kW / 220 PS up to the new 206 kW / 280 PS powered exceptional engine of the Scirocco R. The 1.4 TSI with 125 PS is used for the first time by Volkswagen; the Scirocco base engine consumes 1.0 litres less per 100 km than its predecessor. Also, the 180 PS powered 2.0 TSI is new in the coupé line-up, following the 1.4 TSI with 118 kW / 160 PS in Europe. Although the new engine develops an additional 20 PS, it is some 0.6 litres per 100 km more economical than the 160 PS version. The adapted 2.0 TSI from the Golf GTI with 220 PS is also new in the coupé; a reduction in consumption of 1.4 litres per 100 km compared to its predecessor or 19 per cent. Diesel engines develop 150 PS and 184 PS. The two Scirocco TDIs now achieve 110 kW / 150 PS and 135 kW / 184 PS. Both engines are extremely economical with 4.1 l/100 km (150 PS) or 4.3 l/100 km (184 PS). The reduction in consumption compared to the predecessor’s less powerful engines is 0.8 litres / 100 km for both TDIs.